My little cousin, she is cute. As often mentioned, my grandma and grandpa have a place on a camp ground in Salem but my uncle has a place there in the nature too with my aunt and their kids. So, when we arrived in Salem to visit them and to enjoy a canoe tour on the last weekend, my little cousin came to me and said “You are in the nature now, which means you need a flower in your hair!”. I thought she is right and said “Well, give me some flower power!” and all laughed. 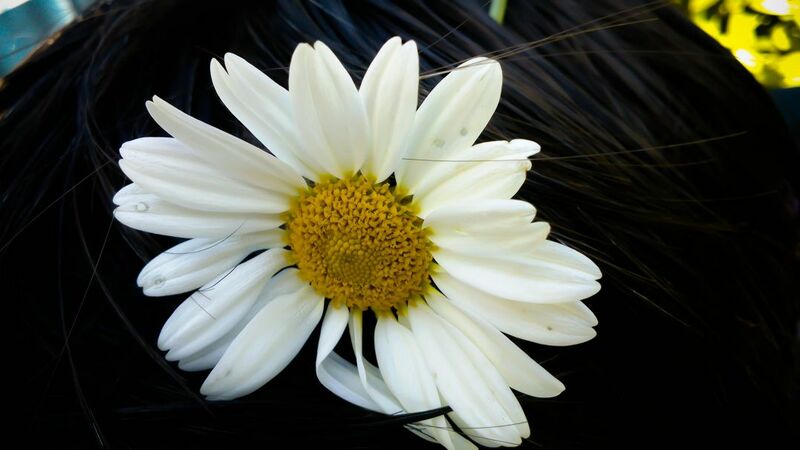 She did grab one of grandma´s flowers and stuck it to my hair and said “Your hair is perfect to give a flower hold, how much hairspray or hair gel did you use?”. I laughed even more when she asked this and said “I expected that you will decorate me, I know you well!”. You know, this is what I like about kids. They are still so creative and playful and have some cool ideas. They believe on their own ideas and the ideas are totally logic for them. This is what we matured people often lost, some of us are too shy to come up with similar ideas. So, I couldn´t deny to get the flower stuck to my hair. Indeed, I was not the only person who became decorated by my cousin. My grandma did look like a flower vase, my mother got enough flowers into the hair too and my little cousin seemed to have fun while spreading happiness and beautiful flowers.